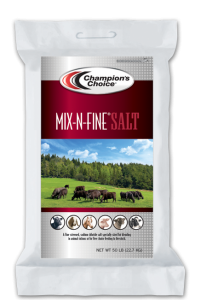 A fine-screened sodium chloride salt specially sized for blending in animal rations (feed mixing) or for free-choice feeding of salt to livestock. 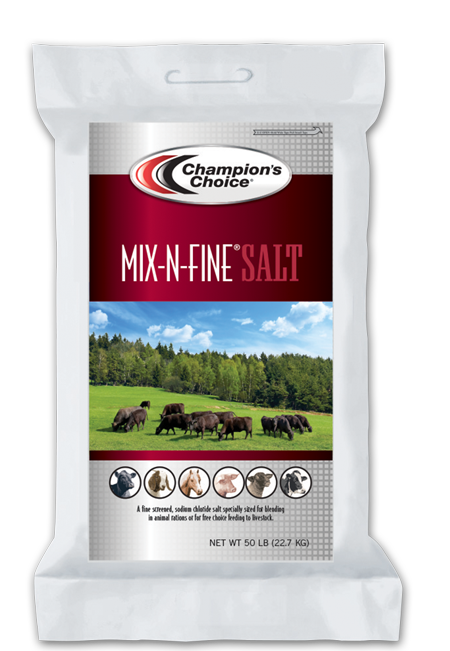 This salt product is intended for beef cattle, dairy cows, horses, goats, pigs, poultry and sheep. This salt is suitable for all animal diets, but should not be used for direct human-food applications. Mix this supplement with rations or feed-free choice to all livestock. How much salt should my chickens consume? It is imperative that salt be part of a chicken’s diet. Salt should be present in chicken feeds at an approximate rate of 0.15%. If salt is restricted in early weeks, the health of the birds may not completely recover. What are the symptoms of salt deprivation for chickens? Chickens that have low salt rations may lose weight. In addition, there may be an increase in pecking behavior, feather eating and general flock nervousness. They may also show signs of reduction of egg production and egg size. How much reduction in egg production will I see in a hen with a low sodium diet? Even a slight reduction in the amount of sodium can result in a 20-60% reduction in egg production over the span of 15 days. For example, if 10 hens normally lay one egg per day, normal production would be 150 eggs over 15 days; with a reduced sodium diet, production could decrease to 90 eggs. What happens if my chickens overconsume salt? Chickens consuming too much salt may reduce their feed intake or could develop kidney disease, resulting in increased mortality rates. Excess salt intake may also result in sticky manure, causing dirty eggs.